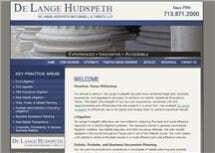 De Lange Hudspeth has provided aggressive advocacy, a high level of business acumen and trusted representation to clients in the Houston, Texas, area for nearly a century. We combine our experience with innovative legal strategies designed to accomplish our clients' goals as efficiently and effectively as possible. Our clients work closely with an accomplished attorney at every stage of their legal matter. The majority of our attorneys have more than 30 years of legal experience and have achieved such distinctions as being included in the Texas Super Lawyers list, receiving board certification in a specific area of practice by the Texas Board of Legal Specialization and being AV Preeminent peer review rated (the highest rating)* through Martindale-Hubbell. Litigation: Our law firm serves the business and commercial litigation needs of clients throughout Texas, including state and federal matters related to real estate, title insurance, appeals and all other general commercial issues. Civil Appeals: Our firm has handled appeals in a majority of the Texas Courts of Appeals, as well as the Texas Supreme Court and the federal courts. One of our attorneys is board certified in civil appeals and has been handling appeals for 30 years. We have the experience needed to either challenge an adverse decision or to uphold a favorable trial court judgment. Estate, Probate and Business Succession: Our lawyers use cutting-edge planning strategies to help our clients accomplish their goals for passing on assets and business interests. We are also equipped to handle estate litigation related to the validity of wills, estate administration, breaches of fiduciary duty and probate of wills. General Business Matters: The depth and breadth of our attorneys' experience allows them to serve as powerful allies to companies at all stages of their life cycles. From entity formation to advance tax planning for established businesses, we provide high-quality representation to our clients. Real Estate Transactions: At De Lange Hudspeth, we are also prepared to help investors, developers and other parties with commercial transactions such as purchases, sales, refinancing and leasing. Our clients recognize our experience and commitment to providing excellent service, and we routinely receive repeat business and referrals from our many satisfied clients. At De Lange Hudspeth, we have been helping clients develop comprehensive estate plans for over ninety years. For nearly a century, De Lange Hudspeth lawyers have represented to clients in general litigation matters throughout Texas. Whether you are defending a successful verdict, or challenging a decision, at De Lange Hudspeth, we have the experience as appellate lawyers to get you the best possible results. De Lange Hudspeth attorneys have been representing clients in title insurance litigation matters from the inception of the firm over ninety years ago. We have experience representing both plaintiffs and defendants in real estate litigation matters.